Traditional boatbuilders were a bit thin on the ground at Beale this year, with several longstanding exhibitors missing. The recession, the cost of stands and the sad fact that few sales are made actually at the show (though the contacts may result in sales down the line) has made boatbuilders with slender budgets think twice. But of the few that made it, a gratifyingly large proportion had rowing boats. 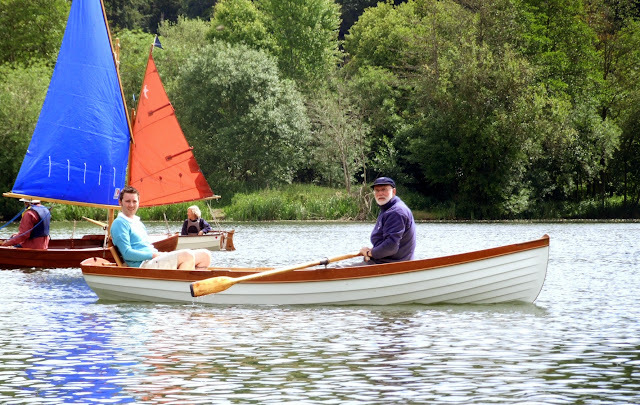 Salter was there with their plastic skiff at a mere two grand (well, £1,995 if you want to be pedantic), and a young company called Classic Sailboats was showing the Menai 14, a lovely skiff in grp with wood trim. Adrian Richardson took me out in her, and she showed a nice turn of speed (one of the sailors complained "Why are you going faster than us?"). She looked great, despite the fact that the varnish was not dry when she was put on the trailer (where have I heard that before?). No price yet, and Adrian said the oars will be longer and spoonier in the production model. Thanks to Mrs Richardson for the photo. Going by your compliments, you rather enjoyed your boat show day! Love when people go for outdoor activities rather than being just couch potatoes. Keep going!